Google has opened its Google+ Hangout service to third-party applications and is adding an apps menu to the video chat application to help people find them. Google released a preview of the Hangout API (application programming interface) in September, but on Wednesday it made it much more appealing to developers by allowing them to share their apps with all Google+ users. It also released a button that developers can publish on a website that launches a Hangout session with their app running in it. 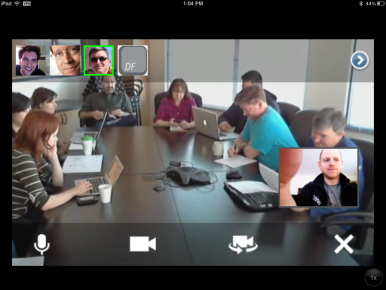 Hangout is the real-time group video chat application that’s part of the Google+ social network. The Hangout apps menu initially has a handful of third-party apps that include games and office-friendly services such as whiteboard- and slideshow-sharing. Users will need to download an app the first time they use it, unless they’re entering through a start button coded into another website. The apps menu will subsequently show a list of recently used apps. “Having an API around Hangout, while it’s a small piece of technology, has broader implications because it really helps [Google] build yet another leg to stand on in terms of getting consumers, and potentially even enterprises at a later point, embedded with their platform and services,” said Brian Blau, an analyst with Gartner. Jeremiah Owyang, an industry analyst with the Altimeter Group, also saw the potential for Google to use an enriched Hangout platform to woo enterprises from competitors like WebEx. If Hangout draws enough interest from developers, the video platform could enable Google+ to offer potentially richer social experiences than its number-one competitor, Facebook. Owyang said the ability to communicate in real time could also prompt users to spend more time on Google+, a metric in which the social network has thus far fared poorly. Visitors spent an average of three minutes per month on Google+ between January and February, compared to six or seven hours on Facebook, according to figures from comScore. The apps available now on Hangout are the Aces Hangout poker game, Cacoo diagrams and whiteboard, Scoot & Doodle drawing app, Slideshare, Clubhouse Challenge by Bravo and Google Effects.